Not content with your festival options? Well, you now have two extra choices because Riot Fest 2011 and Riot Fest-East have announced their line ups. 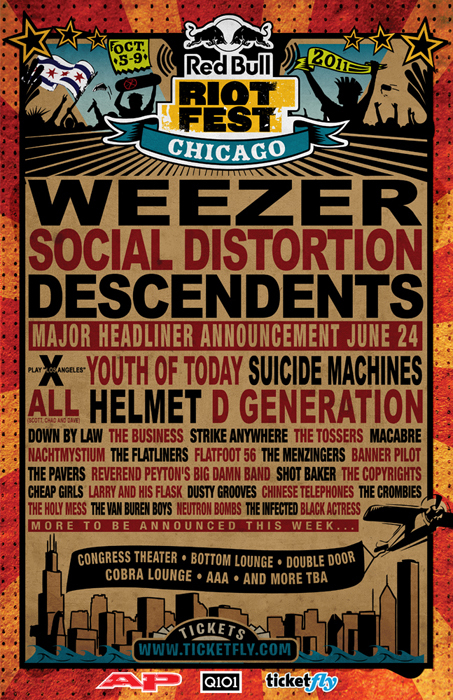 The Chicago line up includes the likes of Weezer, Social Distrotion, Descendents, X, Youth of Today, Suicide Machines, Helmet, The Menzingers, Cheap Girls, The Copyrights, Chinese Telephones and about a million other bands. Riot Fest 2011 will be taking place over the weekend of October 6 – 9 in Chicago and tickets will be going on sale Friday June 24 at 9 AM Central time. While Riot Fest-East will be a one day event on September 24th in Philadelphia, and it will be featuring a slimmed down but still impressive line up which includes the Descendents, X, Dead Milkmen, Hot Water Music, Naked Raygun, Suicide Machines, Samiam, The Menzingers, Larry and His Flask and more.